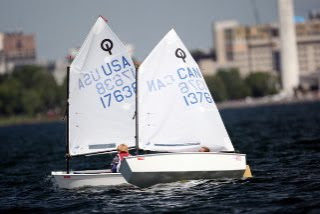 LISOT sailors turned in an impressive showing at the 2009 CORK International Regatta in Kingston, Ontario, with 4 of our sailors finishing in the top 10! 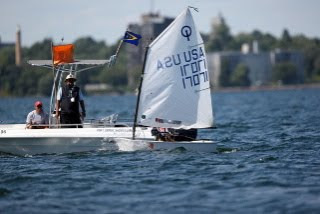 Continuing the very strong summer for LISOT, 4 sailors headed up to Canada with coach Marcos in the drivers seat (literally) to put in some practice at the venue for next years' IODA North American Championship. They were joined by sailors from upstate NY and Toronto. The CORK team, having recently taken home silver at many large events (Drew 8th at National's, Harry 2nd at New England's, Reinier 1st at JSA Champs, and Megan 8th and top girl at the British Nationals,) sailed very well in the mostly light to moderate air conditions. 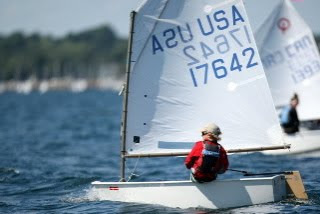 Wind was often 12 knots or less for the 4 day regatta held on a very choppy Lake Ontario. Drew battled Ben Garber (Deephaven, MN) and Harry for the #2 spot, with Ben and Harry tied, finishing just 2 points behind Drew. Reinier, who got off to a tough start on day one, turned in very consistent finishes for the next 3 days and moved up into the 5th spot. 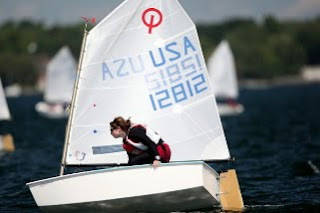 Megan, who had been in a 3-way tie for 10th, had all top 10 finishes in the final 5 races to solidify her 10th overall. She was also the top US girl.